The Fingerist: on stages everywhere soon? There are now plenty of iPhone peripherals for music makers, but while many have an obvious market, it's fair to say that Evenno is taking a bit of a punt with The Fingerist. Announced earlier this year but only just available, this strap-on device enables you to play your iOS instrument apps as if they were a guitar/keytar. The picture in the gallery above goes most of the way to explaining how The Fingerist works - slot your iPhone/iPod touch into the middle and hear it through the built-in speaker - but it's also worth pointing out that there's a line output, too, plus a volume knob. 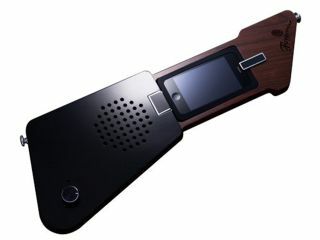 The device is battery-powered via 3 AAs and can supposedly run for up to six hours on one set. The Fingerist is available now in the US for $150 - at that price, we think you're going to have to be a pretty committed iPhone instrumentalist to invest. What's more, like all dock-connecting iOS peripherals, it's not universally compatible: only the iPhone 3G/3GS and iPod touch 2nd and 3rd generation are supported, meaning that The Fingerist won't work with the latest versions of each. Hats off to Evenno for being bold enough to bring this thing to market though: we wish it well.